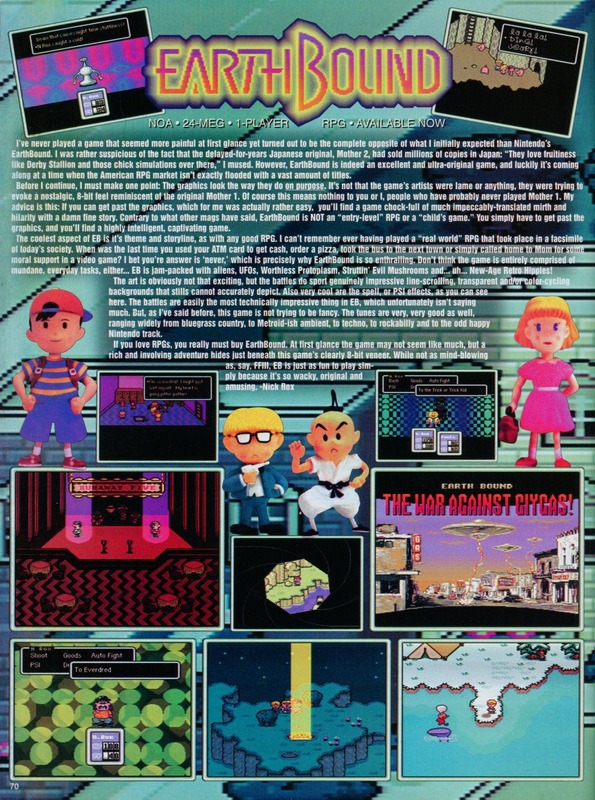 I don’t recognize the name of this magazine, but they definitely gave EarthBound some high marks and praise. It’s a nice contrast to how the more mainstream magazines were treating the game at least. And judging from the screenshots, it looks like they got the game after its release AND played through a lot of the game. Sweet! That rocks! After actually reading their review, it sounds like they really did get the point of Earthbound. That’s so rare. When they underlined “The graphics look they way they do on purpose.” I was kinda shocked. Well, to be fair, Comix Zone is a pretty fantastic game, and is extremely original. Graphics were possibly considered even more important back then than they are these days. Maybe not quite in the same way, but the first “Realistic” looking games were just starting to come out and there was a high prioraty placed on violence and blood because that’s what “mature” gamers wanted. Of course, it sounds silly now, since nothing in the SNES days could be all that realistic, but it was also before the counter culture that supported more lighthearted games really showed up. Being labled “Kiddy” was possibly a bigger death sentence for a game back then than it is now. It’s nice that they gave it a generally positive review, but I felt like if I had to read one more variation on “if you can get past the graphics, this is a deep game,” I would have screamed. Seriously, what the hell did all these reviewers back then see as wrong with EB’s graphics? This is what we fans of colorful, “friendly” games, who happened to be kids/teens in the ’90s, had to put up with from other gamers. I don’t get it. 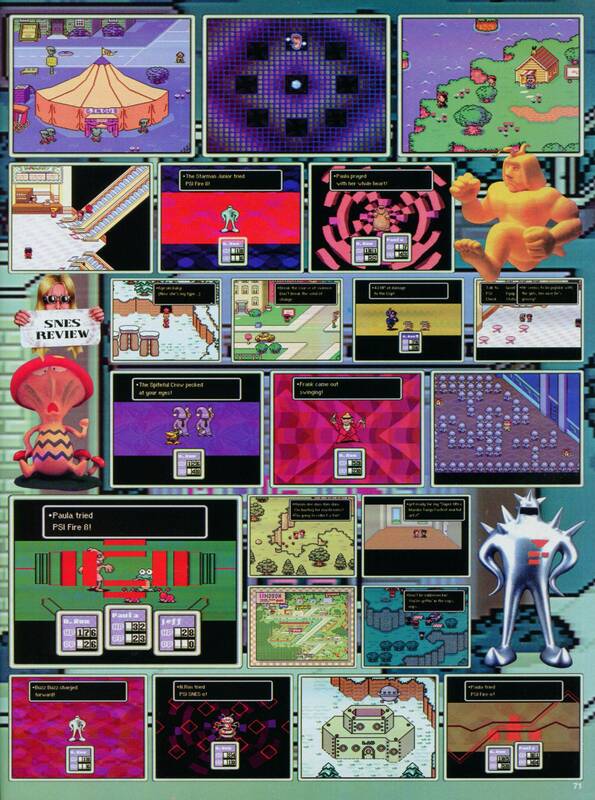 Not one had it crossed my mind that Earthbound’s graphics were ‘kiddy’. Thats just the way Nintendo games were like in those days. Look at Mario, Zelda, Kirby, even Metroid, none of these game were meant to be ultra realistic. Mother 2 didn’t sell millions of copies In Japan…did it? No, that was a myth that lasted for a good while though, especially back then. @Ness PK Rocks No. It only sold 300,000 copies. Besides that this seemed polished and he did his homework for the Mother 1 part (remember Starmen.net nor Google exsisted back then). Yeah, I was surprised he knew as much about the series as he did, to be honest. DieHard GameFan! Recognize! I miss this magazine almost as much as the recently departed Nintendo Power. No way! I totally wish I had a (bigger) pile of rad ’90s game zines featuring people with names like SKID and NICK ROX! Oh how I loved buying Gamefan back in the day, always thought they gave way better and less bias reviews. Wonder if I have this issue somewhere. It’s amazing how i played Earthbound just last year at the age of 13, and i never really noticed the graphics. Actually, i did, and i thought they looked pretty cool. I never thought they looked “kiddy” and i still don’t. Maybe I’m just easily impressed or whatever, but graphics don’t bother me unless they’re EXTREMELY bad. Gamefan definitely had greater interest in (and respect for) Japanese rpgs than other multiplatform magazines of the time. Sometimes I think their love of quirkier, super “Japanese”-type games went to an extreme, like when (if I remember correctly) they gave N64’s “Mischief Makers” several scores of perfect 100s. This is probably the best response to Earthbound given by any other magazine besides Nintendo Power; thankfully NP had a vested interest in making it successful and gave it lots of hype, otherwise it might have gone completely off the radar, what with other magazines obligated to devote large sections to failures like 3do and 32x while almost completely overlooking gems like EB. As much as people complain that NP was a propaganda machine, at least it was a truthful propaganda machine (well, for the nes and snes eras anyway, with exception to the Donkey Kong Country rubbish). SOMEone recognizes greatness in the *DARK TIMES. Woo! Lttp on this. Gamefan had its flaws but overall it was the best gaming mag of its day and this is more proof of that. 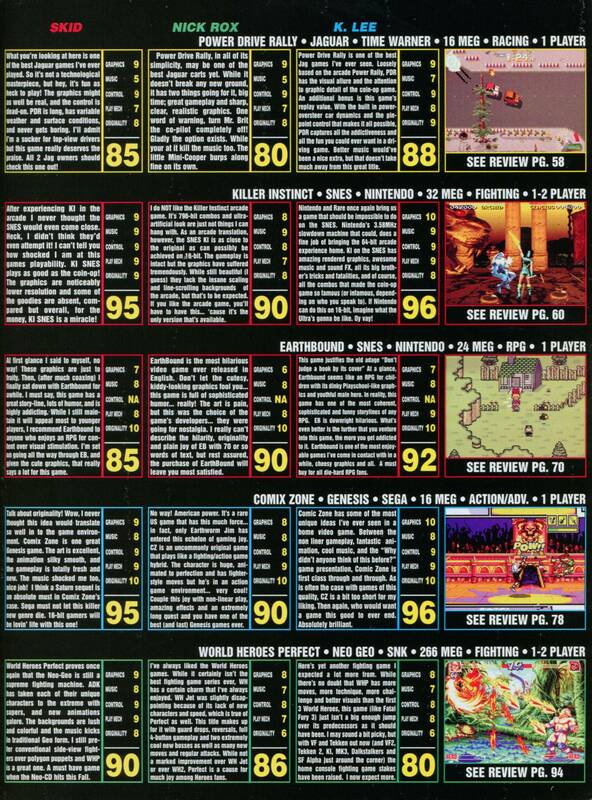 As another example of how terrible gaming mags could be in the 1990s, Game Players actually gave Yoshi’s Island for the SNES an insulting score of only 70%, something Gamefan openly mocked and called them out on when they gave their own review scores for YI (100s across the board as it should be). But yeah, very refreshing take compared to the other horrendous EB ’90s mag reviews.